Driving on route 106 in Belmont recently, I was really pleased to notice that Sleeper Welding is advertising its business with a beautifully crafted metal whirligig of a blacksmith working at his forge. It pleased me to see it because just a few weeks ago, during the heavy winds and driving rain, I stood at my living room window and watche d another whirligig – this one of a somewhat crudely crafted weather-beaten wooden man sawing wood for all he was worth. This little piece of wind-driven folk art was given to my father by his great-grandson and has stood attached to a deck post for over fifteen years, seemingly indestructible, tirelessly sawing wood every time the wind blows. Folk toys have been around for a very long time. One of the oldest known folk toys is the hobby horse. A stick with a horse's head on one end and wheels (or not) on the other end, it was known in Greece at the time of Socrates, while a variation of the yo-yo was known in the far east in ancient times. Folk toys have endured because they are fun, easy to make and usually have non-breakable parts that don't wear out. Most depend on gravity, wind or hand power for movement. Made by the "common man" out of whatever material was at hand (most often wood), the design and the principle of operation are simple. In America, such toys were originally made for children by an immigrant parent, perhaps carrying with them ideas from their own childhood experiences. The ideas may have remained the same, but the interpretation and execution were as varied as the creators. Because of the basically simple structure and easily obtained materials they could be created and repaired by almost anyone. Probably at one time or another, we have all played with a toy that was based on an example of an early American toy created by an unskilled toy maker, perhaps a farmer or a miller, for the amusement of his child. No two were exactly alike. Some toy makers were more skilled with the use of a knife, a saw or a paint brush than others of course, but what the toys had in common was a comical, winsome, unpretentious quality and inexpensive, locally available materials. Perfection was not demanded as they were not conscious of themselves as an art form. Perhaps the creator whittled, carved or sewed as much for his/her own amusement as for any other purpose. 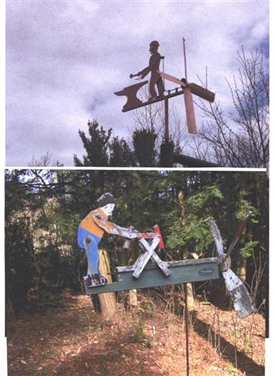 Although Sleeper's sign advertises "fine crafted metal art", whirligigs, like most folk toys have not always fallen into the category of art. But the interest of collectors has created a demand which has now elevated examples of these early toys to the status of Folk Art. According to John R. Nelson, Jr. in his book "American Folk Toys", the period of greatest productivity and highest quality in America was from 1776 to 1876. In 1850 the Bureau of Census listed 47 professional toy-makers, but by 1880 there were 173 listed. And many small factories were producing toys in tin and cast iron as well as wood. Today, folk-toys are often not considered to be toys at all. For example, consider Sleeper's elegant whirligig. More commonly referred to as folk-art, these once simple toys are in a period of revival and are made as much for decorative purposes as for the amusement of children (and adults). The designs may be original but they are usually based on traditional styles. The creators are more conscious of their creations as a form of art and depending on the degree of skill may command a high price as "folk" art. In addition to whirligigs, some forms of early folk toys are whimmydiddles known for the whirling movement of a propeller attached to a notched stick; the climbing bear, a simple cutout of a wooden bear which climbs up a pair of cords by alternately pulling on the cords; stilts; the dancing man, or limberjack, an agile loose limbed, jointed wooden figure which dances on a small platform; the mystifying Jacob's ladder, falling blocks of wood attached to a double-acting hinge; the spinning top with a pull-handle which dates back to 1200 B.C. in Greece and Egypt; the jointed penny doll from England and the corn husk doll first created by native Americans. You can undoubtedly think of a number of other examples.